M5 is a supplement Cellucor has had available previously and in many different versions, which has now returned for 2019 in the form of M5 Ultimate. Much like the previous M5 releases, Cellucor’s M5 Ultimate is primarily a creatine product intended to help build muscle and strength. Cellucor has kept the formula in its all-new M5 Ultimate pretty short and sweet with four main ingredients, and three of those are premium, patented ingredients. 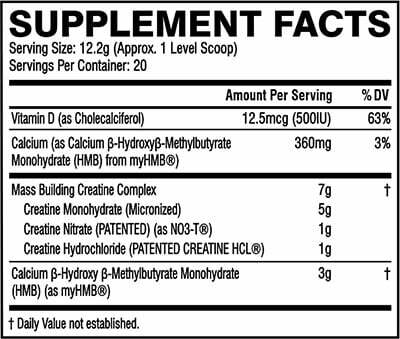 Like the majority of the brand’s advanced Ultimate Series of supplements, M5 Ultimate does keep things open and honest, and features a fully transparent label. As mentioned, Cellucor M5 Ultimate is primarily a creatine product for which it has a combined 7g of creatine made up of 5g of creatine monohydrate, and a gram each of creatine HCl and NO3-T creatine nitrate. Also in the mix for the return of M5 is 3g of HMB as the branded myHMB. Cellucor plans on making its newest Ultimate Series supplement available for purchase later today through its online store at cellucor.com. It’ll have two 20 serving tastes to choose from in Fruit Punch and Icy Blue Razz, each packing 20 servings per tub, with the retailer GNC also due to be stocking M5 Ultimate at some point.